I often get asked how I get my binding on potholders and placemats so even. DH thinks when I make them, I am practicing voodoo. ;) The secret to my success is lots of pins!! I make my own 1/2 inch wide double fold binding from 2 inch wide bias strips and a Clover Bias Tape Maker. I don't recommend any other brand of bias makers. The Clover brand makes a better fold than any of the others I have tried. Before applying the binding I zigzag the raw edges of the potholder or placemat together. This gives a nice firm and secure edge with nothing that will get caught in the seam when attaching the binding. After zigzagging the edges of the potholder or placemat, I open up one fold of the binding, pin to the back side, stretching slightly as I round the corner, and then sew in the crease of the fold. Rounded corners are easier than square because you don't have to miter. 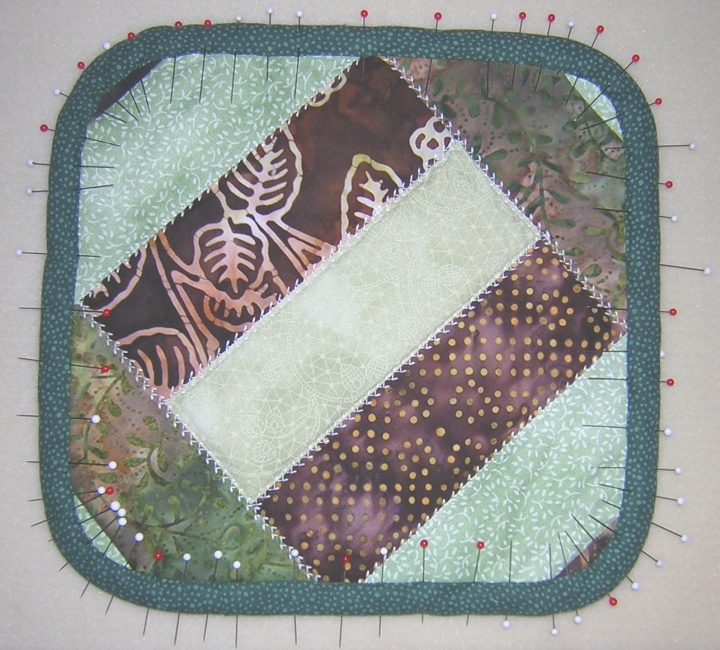 If you plan the overlap where the binding meets, for a spot where the fabric in the face block blends or matches with the binding, it won't be as noticeable. Once the binding is attached to the back side, I fold it over the raw edges to the front for the final pass of stitching. 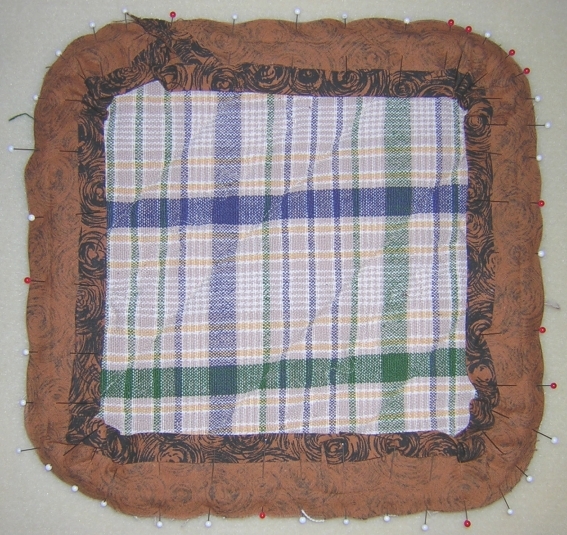 View from the back side with one fold open: Pins perpendicular to the edge are easier to pull out and can be spaced close to prevent puckers and pleats. 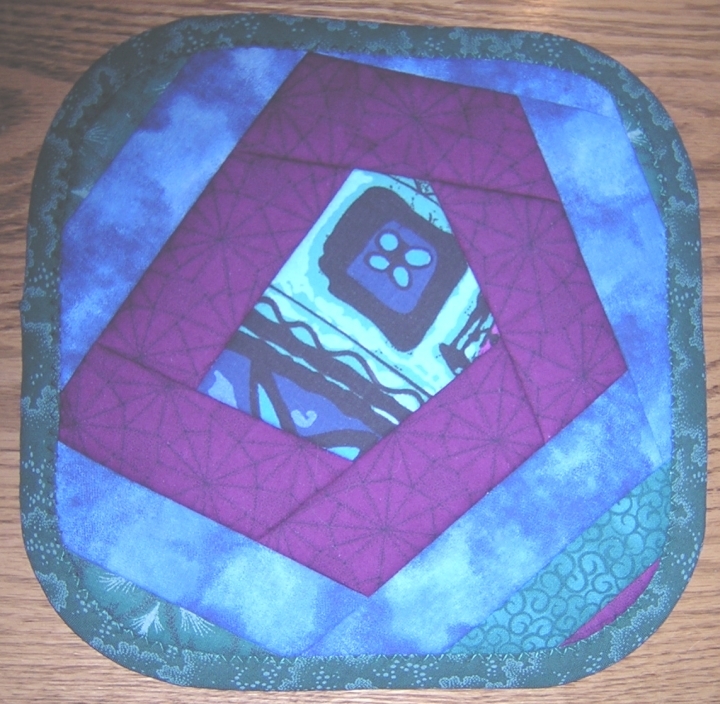 My binding is attached just like shown for the Retro Fun Quilted Mitts. But, I pin like crazy and I generally choose to use either my Pfaff 7570 or Davis VF. Both machines have an upper feed system that insures the multiple layers move between the presser foot and throat plate without puckers and folds. You could choose to use a walking foot attachment, too, but some machines have multiple feed dogs to ensure even feeding. You may not need to use a walking foot to avoid puckers. It doesn't matter if you pin from the inside or the outside, just catch the binding and the top layer to prevent distortion. Unless you really have the Midas Touch with a sewing machine, I recommend you zigzag topstitch the binding down on the last pass. Thirty years ago in a quilted jacket class, a master seamstress told us that unless you hand stitch the binding down, it will never be perfect by machine. 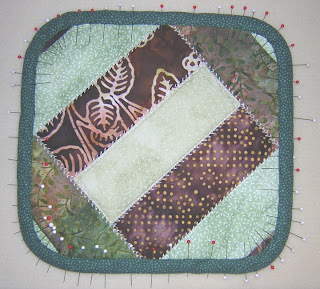 Instead, if you must use a machine, zigzag; it will look "straighter" than if you tried to straight stitch it in place. I have faithfully followed that advice because the binding is never exactly the same on the front and the back and straight stitching just accentuates all of the inconsistencies on the back side. Additionally, if your machine likes invisible thread, you can use it to mask the faults. Note: If you like to hand stitch, just reverse the side you sew the binding on in the first pass. Sew to the front and flip to the back, then use a hand blind-stitch to sew down the binding in place of zigzag.